Perry Werden: One time I hit the ball so hard that it broke in two. Half of the ball struck a “Hit Me for a Free Pair of Shoes” sign on the left-field fence; the other half was retrieved by the left fielder and thrown in to the catcher. As I steamed home, the catcher tagged me with half a ball. The umpire called me out, but I successfully argued that our team deserved half a run. It was a close game and we won by the score of 2½ to 2. Reporter: That’s an amazing story, Perry. Did you get a free pair of shoes? Playing for Minneapolis in the Western League, Perry Werden slugged 43 homers in 1894 and 45 homers the following year, totals unprecedented in Organized Baseball and unsurpassed until Babe Ruth clouted 54 home runs in 1920. Werden’s career in professional baseball spanned more than 25 years, including five full seasons in the majors. Talkative, clever and witty, the big first baseman was a master of the hidden-ball trick and one of the most colorful characters in baseball. Reporter: What is it like in Lincoln, Nebraska? At 6-foot-1 and nearly 200 pounds, Werden was as “big and broad as one of the courthouse doors.”9 In 1887 he hit .386 and played first base and the outfield for the pennant-winning Topeka (KS) Golden Giants of the Western League. Three times he slugged two home runs in a game, and on May 18, 1887, he clubbed five doubles in a 14-8 victory over Lincoln. After the Golden Giants’ season ended, Werden played briefly for the Des Moines (IA) Hawkeyes, and in the offseason he married Mamie Hardy of St. Louis.10 In 1888 he played for the New Orleans Pelicans and Troy (NY) Trojans, and in late September he appeared in three games for the Washington Nationals. Reporter: What qualifications should an umpire have? Werden: He should be an extremist, too little or too big to assault. Reporter: What will stop verbal abuse of the umpire? Reporter: How would you describe the fans? Facing Washington pitcher Doc McJames in the second game of a doubleheader on July 21, 1897, Werden reputedly stroked “the longest hit ever made in Louisville . . . a long home run fly between center and left [that] did not strike the ground until it was within ten feet of the center-field fence, hitting the fence on the first bound and getting lost behind the score board.”38 In the same game, a 9-4 victory for the Colonels, Louisville’s impressive rookie, Honus Wagner, tripled. Werden had a fine season that year, batting .301 and leading the Colonels with 14 triples and 83 RBIs, but he wanted to return to Minneapolis, so Louisville obligingly sold his contract to Minneapolis in January 1898.39 John Hayne, a spokesman for the Minneapolis club, gave some hint as to why Werden wanted to return. “We made a good deal with Louisville, whereby we get the king of first basemen, Perry Werden, and put the fans in the best of humor. 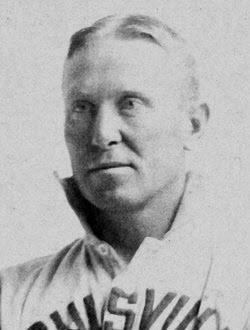 Perry ... is the greatest favorite that ever wore a Minneapolis uniform.”40 Unfortunately, on the eve of Minneapolis’s 1898 season opener in Kansas City, Werden tripped on a sidewalk and fractured his kneecap, an injury so serious that it was believed he might never play again.41 He missed the entire 1898 season. Werden wanted to manage a team, and he was given the chance briefly with the St. Paul Saints of the Western League at the start of the 1901 season. The stint didn’t last long. Veteran outfielder Jimmy Ryan became part owner of the team and took over as manager,46 and Werden was traded to Des Moines where he finished the season. He rejoined the Minneapolis club in 1902. Though close to 40 years old, “Old Man” Werden could still hit the ball. His home run on May 19, 1902, in Minneapolis was said to be “the longest drive ever seen on the home grounds.”47 The following season he helped Memphis win the Southern Association pennant. In 1904 Werden became player-manager of the Fargo, North Dakota, team in the Northern League, but it did not go well. His execration of umpires continued unabated. He berated them profanely, and in one game he threw mud at the ump.48 Disgusted, he resigned in July with his team in last place.49 He didn’t do any better on teams in Hattiesburg and Vicksburg, Mississippi, in 1905 and 1906. Then, wonders to behold, he joined the accursed class and became an umpire, working in the American Association from July 1906 until the end of the 1907 season. Reporter: How did you become an umpire? Reporter: Is it difficult to umpire a twilight game? Reporter: Do you throw kickers out of the game? In every game Perry, fat and good natured, is to be seen on the line, coaching the Indianapolis runners, giving advice to the batters and, in fact, acting as a papa to the entire team. He can not help from being a genuine, riproaring farce. Perry is funny without trying to be so and that makes him funnier than ever. Beyond his humorous side, however, he is endowed with a fund of good, common, hard sense, and, above all, he is one of the best hearted men alive. On January 9, 1934, Werden died of a heart attack in Minneapolis. The great slugger with the quick wit was a unique character in baseball history. The dialogues between Werden and Reporter portray newspaper accounts of Werden’s humor and are not exact quotes. 1 Vicksburg [Mississippi] Evening Post, April 4, 1907. 2 St. Louis Post-Dispatch, April 15, 1894. 3 Some encyclopedias give his name as Percival Wheritt Werden, but he and his grandfather are identified as Perry, not Percival, in census records. 4 Baltimore Sun, August 12, 1891; Minneapolis Tribune, March 9, 1913. 5 Sporting Life, October 1, 1883; St. Louis Post-Dispatch, July 17, 1883, August 28, 1897. 6 St. Louis Post-Dispatch, April 29, July 10, 1884. 7 Topeka [Kansas] Daily Capital, April 21, 1887; Western League, accessed November 30, 2016, www.baseball-reference.com/bullpen/Western_League . 8 The Sporting News, May 24, 1886. 9 Ibid., November 27, 1886. 10 Sporting Life, May 18, 25, June 1, 15, 1887, February 15, 1888. 11 Ibid., October 4, 1890; Rochester [New York] Democrat and Chronicle, September 12, 1889. 12 Baltimore Sun, January 31, 1891. 13 Sporting Life, April 5, 26, 1890. 14 Baltimore Sun, April 22, 28, 1891; Philadelphia Inquirer, April 28, 1891. 15 St. Louis Post-Dispatch, Baltimore Sun, both June 3, 1891. 16 Sporting Life, June 27, August 8, 1891. 17 St. Louis Post-Dispatch, March 20, 1892; Pittsburgh Press, October 20, 1892; Detroit Free Press, January 3, 1896. 18 Bill Deane, Finding the Hidden-Ball Trick: The Colorful History of Baseball’s Oldest Ruse (Lanham, MD: Rowman & Littlefield, 2015), 28; Chicago Inter Ocean, July 25, 1893. 19 St. Paul [Minnesota] Globe, May 29, 31, 1894. 20 Ibid., July 24, 1895; Sporting Life, July 27, 1895. 21 Sporting Life, December 7, 1895. 22 Joel Rippel, “Perry Werden’s Record-Setting 1895 Season and the 1890s Minneapolis Millers,” The National Pastime, 2012; accessed November 30, 2016, sabr.org/research/perry-werden-s-record-setting-1895-season-and-1890s-minneapolis-millers . 23 St. Louis Post-Dispatch, July 9, 1894. 24 St. Paul Globe, June 28, 1895. 25 Indianapolis News, May 3, 1907. 26 St. Louis Post-Dispatch, September 12, 1892. 27 Sporting Life, August 29, 1896. 28 Minneapolis Tribune, April 26, 1896. 29 Ibid., September 27, 1896. 30 Sporting Life, October 19, 1907. 31 Indianapolis News, May 3, 1907. 32 Sporting Life, January 30, 1897; Western League, accessed November 30, 2016, www.baseball-reference.com/bullpen/Western_League. 33 St. Paul Globe, October 2, 1896. 34 Sporting Life, January 9, 1897. 35 Ibid., May 1, 1897. 36 Pittsburgh Daily Post, April 27, 1897. 37 Deane, Finding the Hidden-Ball Trick, 31. 38 Louisville Courier-Journal, July 22, 1897. 39 St. Louis Post-Dispatch, September 18, 1897; Louisville Courier-Journal, January 9, 1898. 40 The [Nashville] Tennessean, January 13, 1898. 41 Kansas City Journal, April 23, 1898. 42 Alan H. Levy, Rube Waddell: The Zany, Brilliant Life of a Strikeout Artist (Jefferson, NC: McFarland, 2000), 44. 43 Minneapolis Tribune, May 20, 1899; Detroit Free Press, August 20, 1899; Indianapolis Journal, August 10, 1900. 44 Sporting Life, October 21, 1899. 45 Kansas City Journal, May 1, 1899; Minneapolis Tribune, August 13, 1899; Sporting Life, February 3, 1900; Indianapolis News, September 7, 1899, August 29, 1900. 46 St. Louis Post-Dispatch, December 26, 1900; Minneapolis Journal, February 22, 1901; St. Paul Globe, May 18, 1901. 47 Indianapolis Journal, May 20, 1902. 48 St. Paul Globe, June 10, 1904; Duluth [Minnesota] Herald, June 14, 1904. 49 Minneapolis Journal, July 19, 1904. 50 Indianapolis News, May 3, 1907. 51 Perry Werden clip file, National Baseball Hall of Fame, Cooperstown, New York. 52 Louisville Courier-Journal, July 30, 1906. 53 Indianapolis News, June 22, September 23, 1908. 54 Duluth Herald, March 27, 1913; [Portland] Oregon Daily Journal, September 6, 1920; Pittsburgh Press, July 28, 1921. 55 Pittsburgh Press, July 28, 1921. 56 St. Louis Post-Dispatch, January 13, 1934.